Sam Hospitality Academy is a hospitality training company, provider, based in South Africa but can travel anywhere to train all aspects of Hospitality. We have trainers, facilitators, assessors who are available throughout South Africa. Sam Hospitality Academy offers over 30 hospitality short courses, most of which are accredited by CATHSSETA. Training is offered at our campus as well as off-campus at your establishment. We also offer target training at your location to help reinforce your guidelines and implement new techniques to establish efficiency and consistency in the workplace with over 30 customized courses. Sam Hospitality Academy is known for its extensive training services that combine a classroom environment with hands-on practical experimentation for those who wish to be employed in the thriving hospitality industry. In addition to certifications and training sessions, we have several 60 hour/ 2 week learnership programmes that equip individuals with the knowledge and know-how to gain and maintain employment in the hospitality industry. Training your employees, or hiring employees that have been through our training program, creates higher morale, greater earnings, a sense of loyalty to a company, longer retention rates and better customer service ratings, all of which foster guest loyalty, repeat business and higher revenue for your business. We can evaluate and improve your business through training. 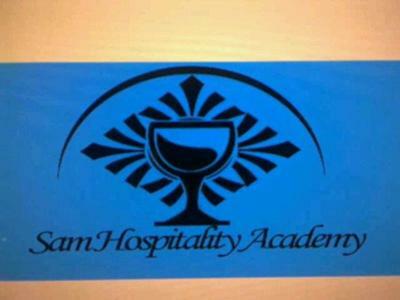 Contact Sam Hospitality Academy today to find out more about our courses and learnership programmes. Clients can mix and match our courses to meet their needs, for instance, they can combine our Front Office course with restaurant skills course. Our rates are highly competitive and our number one aim is to be of value to your business, through increased revenue, reduced costs, greater customer returns, higher staff retention rates or improved employee efficiency. Some of our courses can even save you up to 15 on insurance premiums. We strive to improve your business efficiency and quality, through training; all the people involved with Sam Hospitality Academy are highly experienced hospitality professionals, with a minimum of 5 years in their specialist field. Who better to understand the special pressures and demands of our industry? Sam Hospitality Academy is proud to be a registered training provider and accredited by CATHSSETA. We look forward to assisting with any of your Training needs now or in the near future. Sam Hospitality Academy believes that great training is a lifelong process and that personal and professional growth comes through knowledge and training. We realize that in the final analysis the employee s motivation can be the most critical ingredient in building a career. Therefore, if the student/ employee will bring the willingness and desire to learn, we at the Sam Hospitality Academy stand ready to fulfill our part of the training partnership. We at Sam Hospitality Academy realize that choosing someone to entrust with your own or even your employees’ education and or training is a major decision and that is why our goal at Sam Hospitality Academy is to provide you with the very best education and or training for an industry that is the largest and fastest-growing worldwide. The Hospitality and tourism industry will be the number one source of jobs worldwide for the foreseeable future. We offer unique short Hospitality Training courses and services (both classroom Academy, and on-site) for all hospitality related businesses, employees and prospective employees working or those looking to work in hospitality industry. Our courses are designed by professionals for professionals. If you are looking to enter the industry or are looking to improve your own or your employees’ skills please take time to review our site www.samhospitality.co.za and then contact us with any questions you may have about our courses or services.